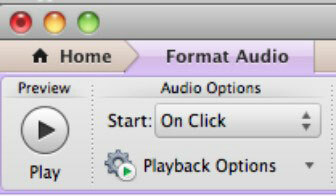 From the Media Browser: Use the Audio tab and drag from the browser into PowerPoint. Insert→Audio→From File: When you select this option, the Choose Audio dialog appears. Navigate to a sound file or use Spotlight to search for a file. Choose Music from the OS X Places list in Finder to navigate to your iTunes library. Insert→Audio→Media Browser: Displays the Media Browser on the appropriate tab. Insert→Audio→Record Audio: Record a sound directly onto a slide. 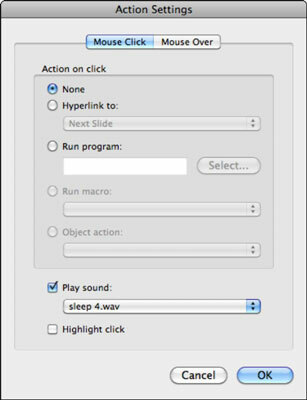 In addition to adding a sound clip or music to a slide using the dialog, you can add a sound by dragging it onto a slide from Finder. After you’ve inserted audio, you see a sound icon. While the Audio icon is selected, take a peek at the Ribbon. There you can find the Format Audio tab. In the Preview group, click the Play/Pause button to start playing audio. Click the button again to pause or to restart playing. Use the Audio Options group of the Format Audio tab of the Ribbon to set how your sound will behave when you run the presentation. Insert an object on your slide. Right-click the object and select Action Settings from the contextual menu that appears. In the Play Sound section, click the pop-up menu and select one of the sounds from the list, or scroll down to the bottom and select Other Sound. Click OK to apply your action setting. The Action Settings dialog includes two tabs: Mouse Click and Mouse Over. The default setting is Mouse Click. If you want to change it so that the audio plays on your slide when you move the mouse over a picture or other object (so that you don’t even have to click the picture), click the Mouse Over tab before selecting which sound to play. Otherwise, the steps to add an action setting are the same as the preceding steps.